My favorite cut of pork is the loin. It can be roasted, grilled, pan fried, braised or cooked just about anyway and it provides a canvass that works well with different flavors from fresh herbs, to marinades and spice rubs, even fruits. Recently, as I scanned the meat counter at the local grocery store, two enormous boneless loin chops jumped out at me and I knew they were destined to fill my belly. They were cut extra thick, at least an inch, making them perfect to stuff with a special surprise. 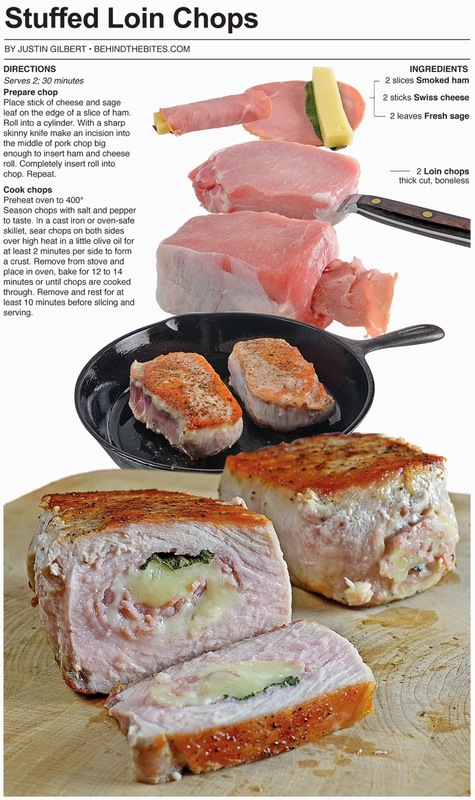 A normal or 3/4-inch cut loin chop isn’t thick enough to hold much when stuffed, but thicker cuts, like the chops features here are perfect. They can hold enough stuffing for it to be a major element. 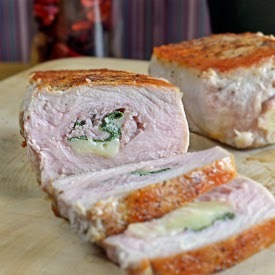 I chose fresh sage with Swiss cheese wrapped in a thin slice of smoked ham for the stuffing. The ham would add a smoky element and make for a nice wrapper for the other ingredients. All of these elements together added up to a tasty main course. I seared a nice crust on the outside in a cast iron skillet then finished them in the oven – which is a fun way to prepare chops, especially for a foodie like myself. I tried something new with the presentation of this recipe. There are only 4 ingredients, but there are a number of steps in the preparation to get to the final product. 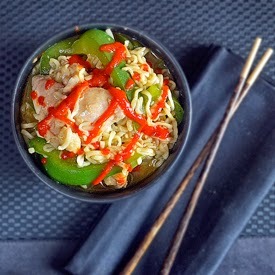 With an emphasis on preparation, I decided to shoot the entire recipe at a 3/4 infinity view on a white back ground. 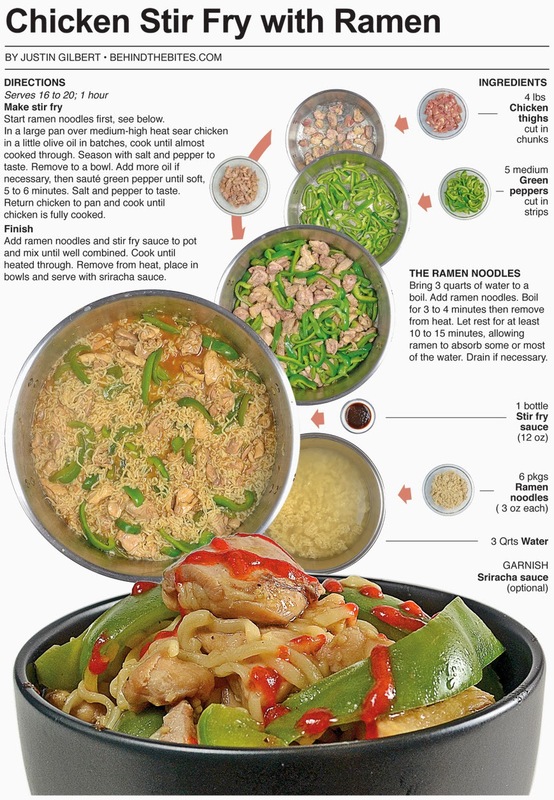 This is probably the only time I’ve ever presented an entire information graphic recipe without any birds-eye view shots. I think the technique will take some refining on my part but overall I like the look of this post. The repeated angle of the different elements combined with the slight overlap of each step seems to create a cascading feel in the presentation. I think I should explore this type of documentation again when it presents itself in the future. Place stick of cheese and sage leaf on the edge of a slice of ham. Roll into a cylinder. 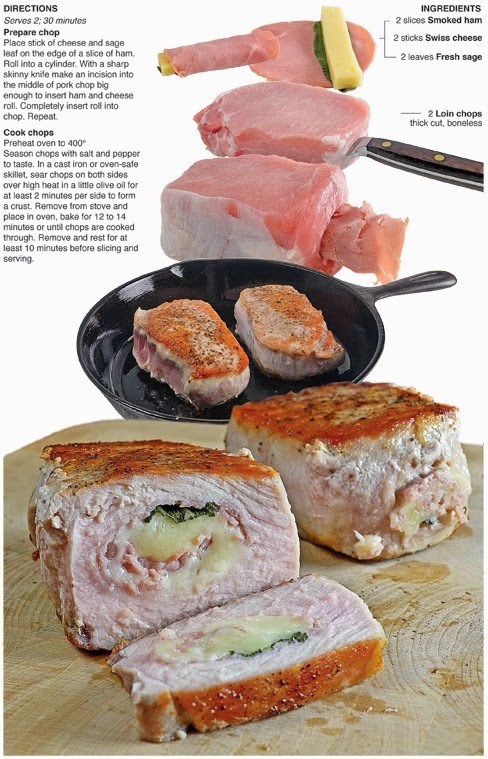 With a sharp skinny knife make an incision into the middle of pork chop big enough to insert ham and cheese roll. Completely insert roll into chop. Repeat. Season chops with salt and pepper to taste. In a cast iron or oven-safe skillet, sear chops on both sides over high heat in a little olive oil for at least 2 minutes per side to form a crust. Remove from stove and place in oven, bake for 12 to 14 minutes or until chops are cooked through. Remove and rest for at least 10 minutes before slicing and serving. I was at Meijer recently trying to figure out what I wanted to cook and was drawing blanks. I went to the store with an open mind and thought I would let what was on sale guide me, but after 20 minutes I wasn't having any luck. That is when I noticed a few recipe cards on a rack in the produce section. 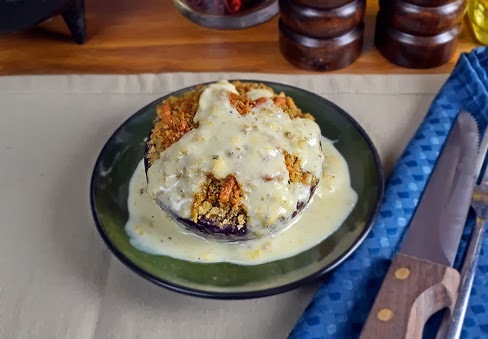 I took a look at one entitled "creamy baked onions" and it sounded like a nice little creation to try. I thought that it would either be a disaster or something delicious. They were sold out of the onions that the card called for so I substituted a different, larger kind. Other than that, I followed the recipe to a T and it turned out really tasty, the only problem was the onions. The larger onions were just to big to cook down into a soft sweet mess that would have resulted had I used the right kind. The outside layers were cooked through but the center couldn't get finished before the topping scorched. I didn't feel the dish was worth reproducing in a labor intensive information graphic like most of my posts, but there was stuff I wanted to mention. First is the yummy topping. 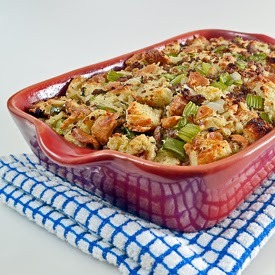 Crushed herb stuffing mix tossed with butter and cheddar cheese was a flavorful and crispy garnish, I think this would be a great topping on scalloped potatoes or even mac and cheese. It was a creative way to ad some snappy flavor and crunch to the dish. Second is the sauce, the mixture cooked into a nice gravy that could be used in a number of different things like a casserole or some sort of creamy potato dish. I can't wait to use some of these elements in an original dish and I'm going to keep a look out for those free recipe cards at the grocery store. This was a smart dish that will lead to some tasty treats in my near future! For the topping, combine stuffing mix, butter and cheese. Mix well and set aside. Whisk together soup, milk, rosemary, nutmeg and pepper to taste until well incorporated. Place onions in a 9 x 13 baking dish. Pour sauce over onions. Cover with aluminum foil and bake for 30 minutes. Remove foil, top onions with topping. Bake 30 minutes more or until onions are soft and cooked through. Remove from oven let cool slightly. Spoon sauce over onions when served. I'm not much of a baker, but my mom and a number of my aunts are all-stars. Over the years, I have left the pies and sweets to them as I developed my skills as a savory cook. 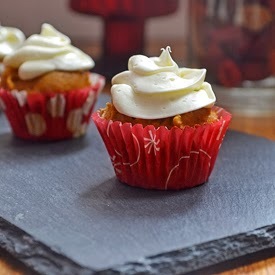 This past Thanksgiving my Mom made mini pumpkin spice cupcakes that were outrageously good. When I asked her about the recipe I was stunned at how easy it was. So easy, that I thought it needed to be shared here. This is the perfect recipe to make with the kids or even leave for another adult to do while your out finishing the Christmas shopping. If you’re not a good baker or blessed with great cooking skills in general, this is the recipe to make to impress the family. Baking doesn’t get any easier than this. Plus, the pumpkin spice flavor is perfect for a holiday treat. A cake mix, can of pumpkin and a teaspoon of pie spice are all it takes to make the cake part and a can of frosting is used for the topping. The hardest part about this recipe is probably limiting the number of cupcakes you devour when they’re served. I have declared my dislike for pumpkin several times at this blog. I sampled two different pies this Thanksgiving and thought they were ok – but nothing I would crave or go back for a second helping. 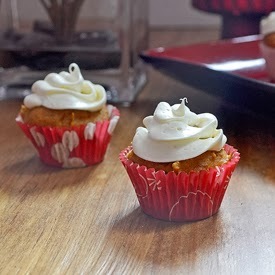 This pumpkin cupcake on the other hand IS DELICIOUS! 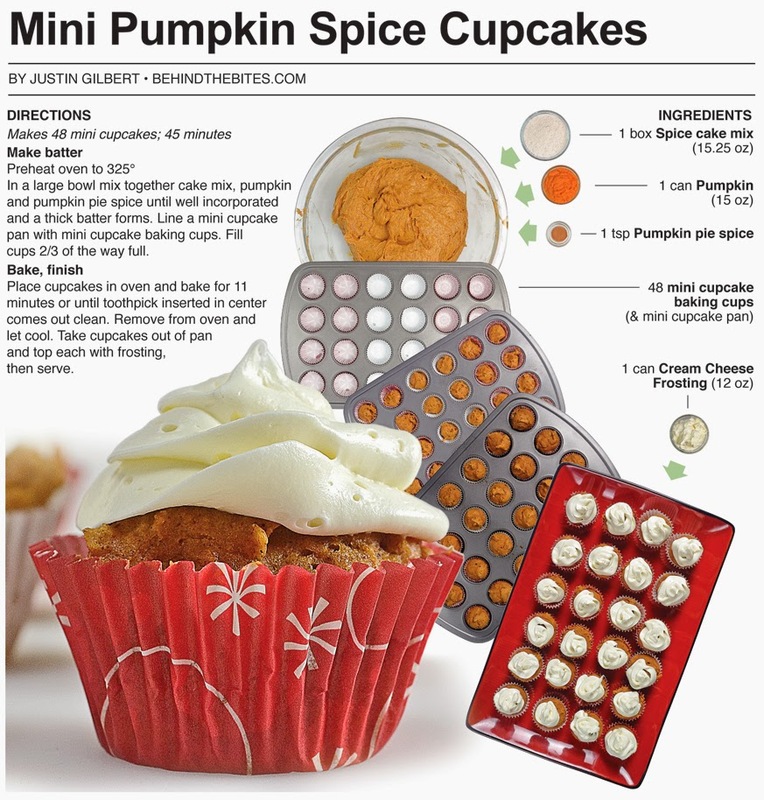 The pumpkin is really just a moisture base for it though, the spice cake mix and the pumpkin pie spices over power the subtle flavor of the pumpkin – which is a good thing to me. 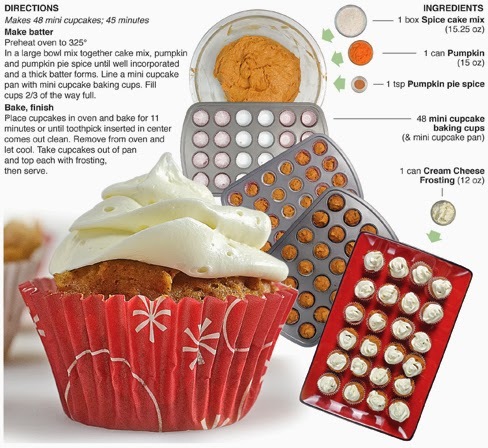 The cream cheese frosting also helps make this simple treat a must try for the holidays. Like I said in the intro, my Mom made these for Thanksgiving and I was impressed. She also impressed my with her choice of items to take to the two family gatherings that we attended. 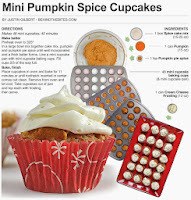 She made two types of garden salad, a cranberry salad and these pumpkin spice cupcakes. At both parties, they were the only salads and cupcakes there, she really filled in some holes on both of the Thanksgiving spreads. So if you can’t think of anything to take to you’re next holiday party, either make these cupcakes or throw together a huge tossed salad – either should be a hit. In a large bowl mix together cake mix, pumpkin and pumpkin pie spice until well incorporated and a thick batter forms. Line a mini cupcake pan with mini cupcake baking cups. Fill cups 2/3 of the way full. The Christmas season has officially arrived and with it comes the onslaught of family get-togethers and office parties featuring pot luck foods and treats loaded with sugar. Like I did last year, I have decided to use the Holiday season as a time for satisfying my sweet tooth and have committed to creating a couple of new holiday treats. This year the treats will be very simple and only require a few ingredients. For this recipe, I use one of my favorite breakfast cereals growing up – Peanut Butter Crunch, which was introduced as part of the Cap’n Crunch line of breakfast cereals in 1969. 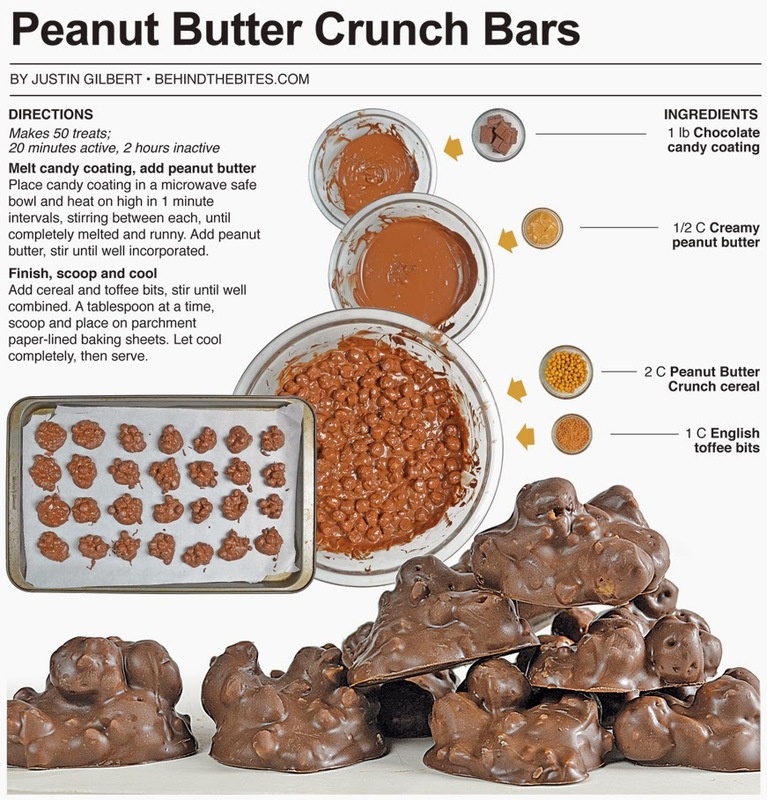 I thought that the crispy texture and peanut butter flavor would be perfect for a homemade candy bar. 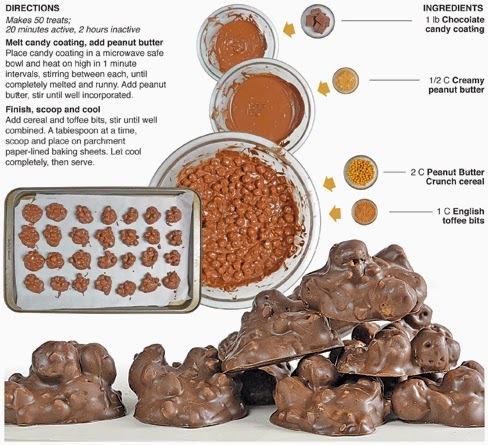 I use chocolate candy coating, or almond bark, melted in the microwave and mixed with peanut butter as the binder and coating for the treat. 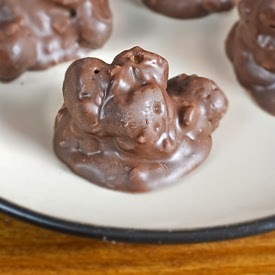 For a sweet surprise with each bite I include English toffee as a compliment to the Peanut Butter Crunch, resulting in a decadent treat that comes together in minutes. I saw a show on the Cooking Channel recently and a chef in New York was featured for having made chocolate covered breakfast cereal a signature item at his candy shop. They showed him tempering the chocolate and bringing it to the perfect temperature, it took a lot of work and expertise to do what he was doing. 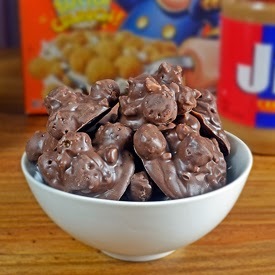 Watching this guy make the perfect chocolate coated cereal got me thinking. I could do the same thing but make it easier using candy coating. That is what lead to creating this treat. I was going to use frosted flakes originally but when I was at the grocery store looking for them, I happened to come across Peanut Butter Crunch. I immediately grabbed the box and changed directions. I made a treat similar in concept to this back in May, and thought a few modifications would make it the perfect chocolate peanut butter bar. I'm not much of a treat maker, so its simplicity makes it perfect for me. I intentionally used the microwave with this one rather than a double boiler, just to make it more appealing to less experienced cooks. A tasty Christmas treat without having to turn on the stove is perfect for the culinary-challenged! Place candy coating in a microwave safe bowl and heat on high in 1 minute intervals, stirring between each, until completely melted and runny. Add peanut butter, stir until well incorporated. Add cereal and toffee bits, stir until well combined. A tablespoon at a time, scoop and place on parchment paper-lined baking sheets. Let cool completely, then serve. This year for Thanksgiving I wasn’t hosting a party, and wasn’t responsible for any of the major traditional dishes at either of the gatherings I was going to. I had made a large Thanksgiving dinner two weeks before the holiday to post the recipes here, so I had my fix of traditional Turkey Day cooking. I did want to make something to take to both the parties though. The day before the holiday I went to the grocery store with an open mind. I found ground turkey on sale, which seems logical. If there is any week of the year when ground turkey would have some serious competition from whole turkey I would bet that week would be Thanksgiving. Having a sale on it is probably the only way to move it off the shelves. I bought a three pound package. Just down the isle I found smoked sausage at a bargain price. Check. After finding the two I thought I would make a Thanksgiving jambalaya. I first browned the turkey then created a vegetable base with the New Orleans holy trinity of green pepper, onion and celery to start the dish. I had purchased red beans to go into the pot and because of that, I decided at the last minute to leave out the rice, I figured the beans would be enough starch. 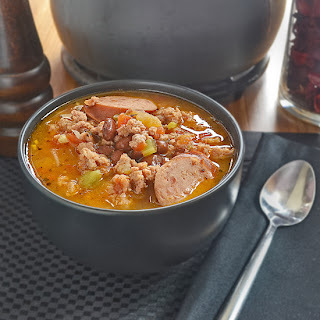 Once I got everything into the pot it was a bit to soupy, so I thickened it with a cornstarch slurry and what I wound up with was a New Orleans inspired Turkey stew. I think I could have still used the rice and made it more like a jambalaya but I’m pleased with the results. I didn’t have hardly any left over so I’m pretty sure it went over well with both sides of the family. This dish marked the first time I had ever used a cornstarch slurry to thicken a dish with success. Years ago, I called my Mom in a frenzy while attempting to make a stew and she told me to add cornstarch to a little water then pour it in. Me being as stubborn as I am, decided to skip the dissolve in water part and just threw it into the pot. Obviously, it didn’t work. I just ended up with a lump of cornstarch in my beef soup. After that I had always used a flour based roux to thicken stews. Acting fast to find a thickener with my Thanksgiving creation, I remembered my cornstarch disaster from yesteryear and decided to go for it. This time I dissolved it in an equal part of water and wala! it worked! Who knew! I was so impressed with the results that I made traditional beef stew a couple days later and used the same technique to thicken it. What I like about using the cornstarch thickener over the flour thickener is that the cornstarch doesn’t change the color. Flour seems to give the liquid a blond color. This is why I love cooking, there is always something new to be discovered. In a dutch oven or large pot over medium high heat brown turkey in a little olive oil, 6 to 8 minutes. Salt and pepper to taste. Remove to a bowl or plate. Disregard all put 2 tablespoons of drippings. In reserved drippings, sauté onion, green pepper and celery until soft, 3 to 4 minutes. Salt and pepper to taste. Add garlic, cook 1 minute more or until fragrant. 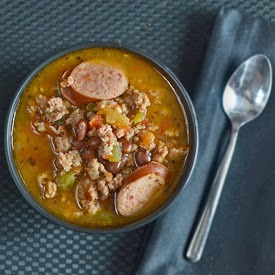 Return turkey to pot and stir in broth, sausage, red beans, tomatoes, Cajun seasoning and oregano. Bring to a simmer and let cook 20 minutes. Whisk together water and cornstarch is a small bowl until cornstarch is completely dissolved. Stir into pot, simmer 10 minutes more or until liquid thickens. Remove from heat and serve. I love to make chili. When I first started cooking on a regular basis, it seemed like I was making up an experimental batch every weekend. I would throw anything in the pot if I thought it might taste good - mushrooms, black olives, egg plant – you name it. 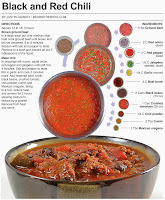 Through making numerous chili variations I realized that one simple item could ruin an entire pot of food! 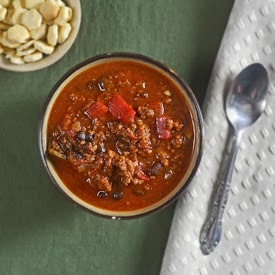 I still make chili on a regular basis but my recipes have been refined and continue to evolve. 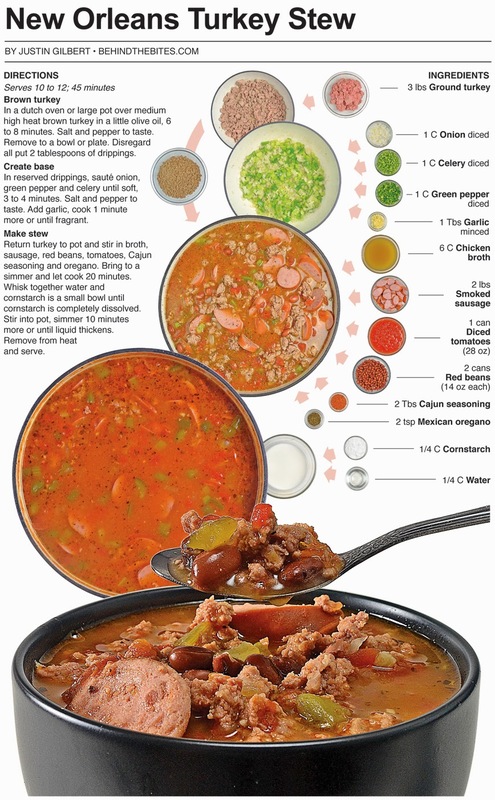 This fall I have made chili numerous times and lately when I have beef as the main ingredient I simmer the entire pot for a couple hours uncovered, which concentrates the flavors and thickens it up. Also, I have been using a fair amount of garlic and onion in the base which opens up the taste buds and amplifies the other flavors in the pot. For sweetness, I add red peppers, and for a fuller bite, black beans have been thrown into the pool. These two additions have inspired the name for my current creation: Black and Red Chili. 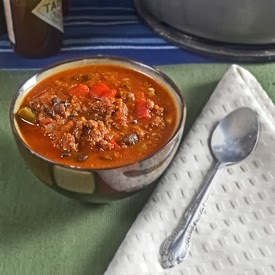 Like I said in the introduction, I love to make chili and this recipe is one of my favorites. 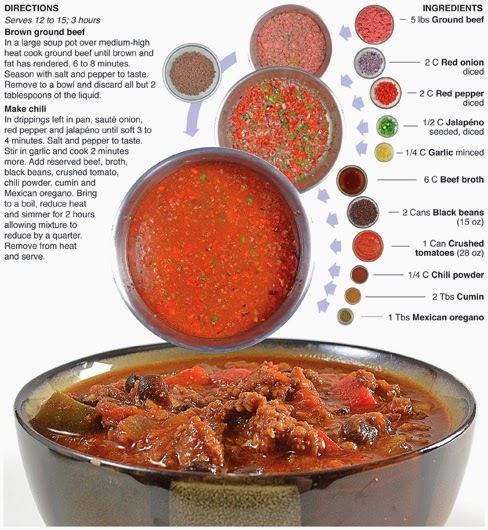 I used to make most of my chili quick, in 30 minutes or less, but I never used any water or broth, the only liquid came from crushed tomatoes. The end result was a thick chili with lots of different flavors in each bite. Over the last couple of years I have started to change my tactics and part of that is adding lots of liquid and reducing it during a long simmer. 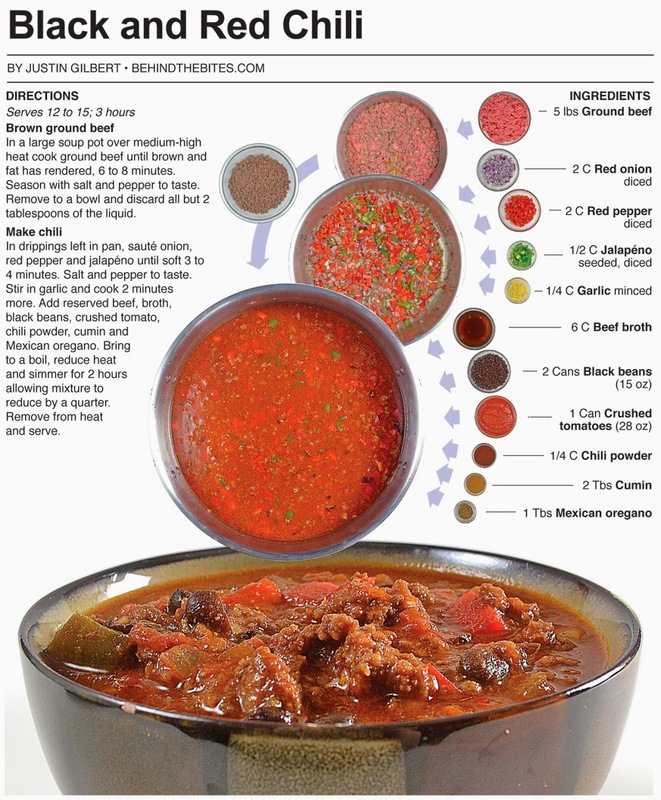 This creates the thick chili that I like, but the end result is consistent flavor with every spoonful. 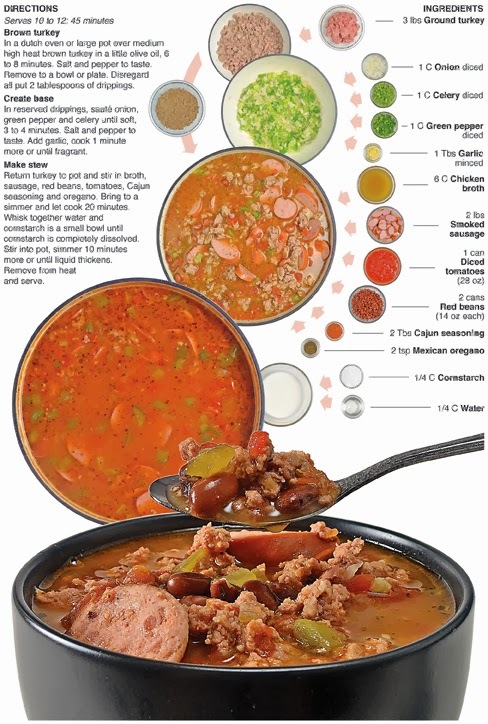 The long simmer not only thickens the chili by evaporating the liquid, but it allows all of the flavors to concentrate and harmoniously mingle. Each bites contains the rich and meaty flavors of the beef and broth with lots of depth from the spices and base vegetables. This chili recipe might be ready for competition. 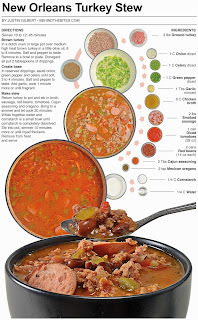 In a large soup pot over medium-high heat cook ground beef until brown and fat has rendered, 6 to 8 minutes. Season with salt and pepper to taste. Remove to a bowl and discard all but 2 tablespoons of the liquid. In drippings left in pan, sauté onion, red pepper and jalapéno until soft 3 to 4 minutes. Salt and pepper to taste. Stir in garlic and cook 2 minutes more. Add reserved beef, broth, black beans, crushed tomato, chili powder, cumin and Mexican oregano. Bring to a boil, reduce heat and simmer for 2 hours allowing mixture to reduce by a quarter. Remove from heat and serve. NOTE: This originally appeared in print the day after Thanksgiving. As we gorge ourselves full of turkey, dressing and pumpkin pie for Thanksgiving, I thought it was my duty as someone who shares my kitchen creations with the public to produce a healthy and tasty bite to counter-balance the gut-busting, diet-crashing cuisine that seems to accompany most holiday celebrations. One of the healthiest foods available in grocery stores today is kale. The non-heading, leafy member of the cabbage family is rich in vitamins A and C, frolic acid, calcium and iron. Kale can be grown in warm climates but it thrives in cooler ones which may explain its popularity among Northern Europeans. 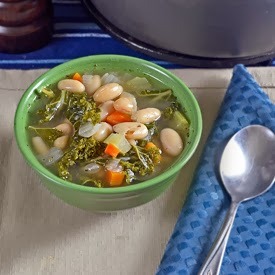 For this recipe, I use it in a soup and it is cooked like spinach, but the kale takes longer to wilt and it doesn’t cook down as much. 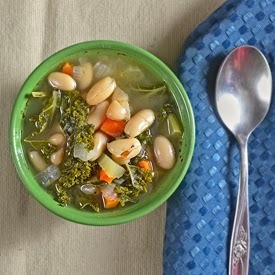 It’s mild flavor is a nice addition to the cannellini beans that become rich and buttery after a long simmer. This soup will be a flavorful and healthy addition to that turkey sandwich smothered in gravy the day after Thanksgiving. This is the first time I had ever cooked with kale. I picked up a batch on sale and I thought it would be nice to try in a soup. I removed the stems and had a large amount of the leaves stuffed in a bowl. I thought that it would wilt down into just a fraction of its size like fresh spinach does. Once it was time for the kale I tossed in a couple hand fulls and waited for it to wilt down. And I kept waiting ... and waiting. I was seriously debating on weather to pull some of it out, but eventually it did cook down, and luckily I had thrown in just the right amount. I didn’t need to add anymore. I ended up using only a third of what I originally thought I was going to use. It was a good experience and I want to use kale again, it has a mild flavor so I think I want to try and sauté it and make it the center piece of a side dish. Then well see how its taste really holds up. In a soup pot over medium heat sauté onion, carrot and celery in a little olive oil until soft, 3 to 4 minutes. Salt and pepper to taste. Add garlic, cook 1 minute more or until fragrant. Recently, an old colleague of mine sent me a note and mentioned how he loved the graphics and layout of my blog, but said he won't try any recipes because he "choses life." Which was his way of saying that he eats tree bark, sticks and unseasoned meat, instead of food that can be enjoyed. Not all my recipes are a death wish, but I admit that many contain a fair amount of weight watchers points and wouldn't be good to eat every day for every meal. That said, I don't eat like that all of the time. 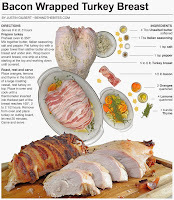 The production that goes into the recipe infographics I present here is pretty intense and takes time to complete, so when I do a recipe in that style I usually go for it with no constraints. This got me thinking. 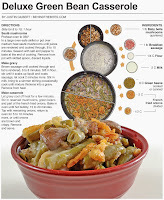 Why not try and publish more of what I eat in a simpler format. This is what I made for lunch today. 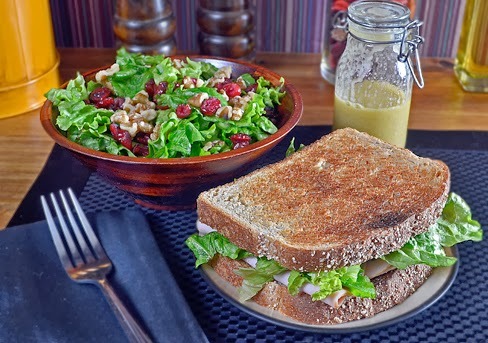 A turkey on whole grain toasted bread with honey mustard and a salad with walnut and cranberry dressed with a mustard vinaigrette. Healthy and tasty and not as bad for you as Breakfast Meatlovers Pizza. I don't know if this will become a regular thing here. But I'm going to attempt to make more posts like this, blog-worthy bites that are healthier and lighter, but presented in a simpler format, which basically means just a photo and a few words. Toast bread, spread a little mustard over both pieces. On one slice layer with sliced turkey, garnish with lettuce, add top piece. 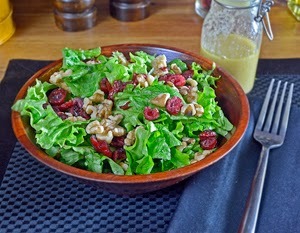 Toss together lettuce, walnut and cranberries. In a container mix together olive oil, vinegar and honey mustard. Shake until emulsified. Drizzle over salad. (makes enough dressing for 2 or 3 salads of similar size. For the last few Thanksgivings I’ve made dressing separately, rather than stuffing which is cooked inside the bird. 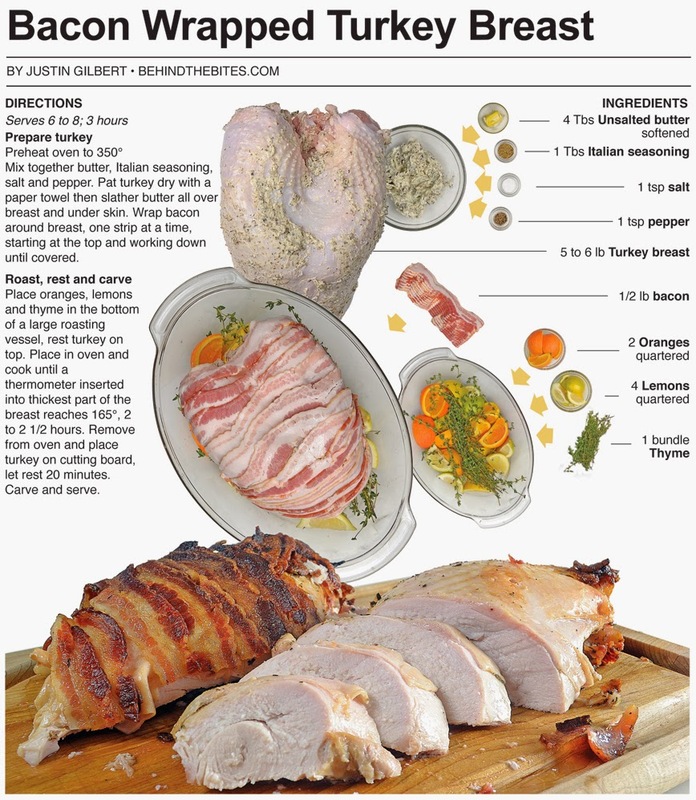 I usually brine my turkey and the last time I made stuffing inside, it was edible, but the overload of salt from the brine was obvious and it really ruined the flavor. Since that disaster I have always kept it separate. 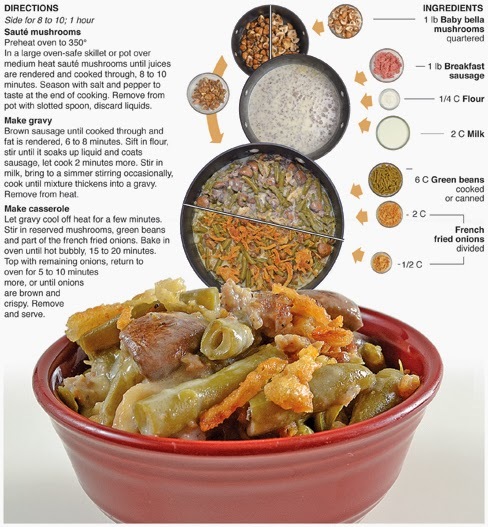 This recipe was the best dressing I have ever made, the sausage, green pepper and fresh sage combine to take the flavors off the charts. I used a loaf of french bread that I cubed and put in the oven at 200° for about 2 hours. This dried the bread out and replicated the results of leaving the bread out in the open for a couple of days. This was a great dish and sadly, it's the final post from my Thanksgiving feast of 2013. I’m already looking forward to next year. I’m so glad this dish turned out. The biggest disappointment of last year's Thanksgiving feast was my dressing. I didn’t have dry enough bread and I didn’t use enough chicken broth to get everything to congeal together. 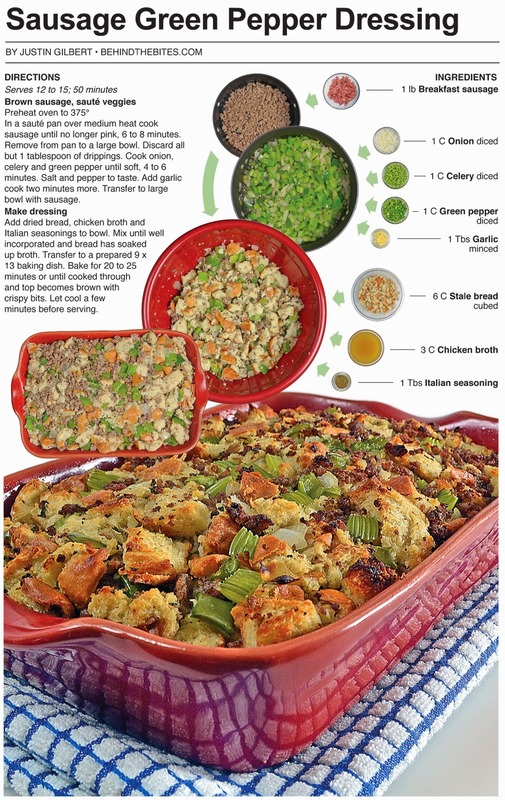 It was more like soggy bread with mirepoix vegetables, so it was important to me this year to have a tasty dressing. 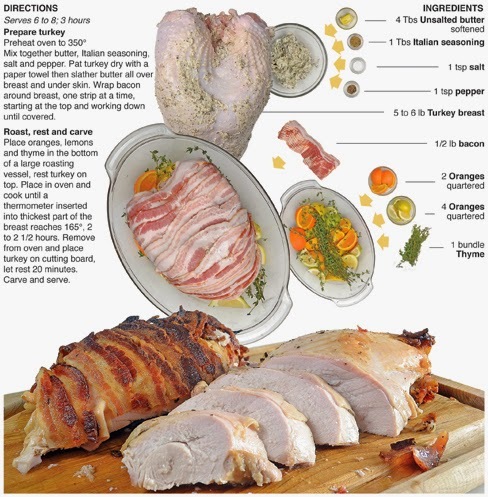 This is also my favorite infographic recipe of all the Thanksgiving 2013 dishes. 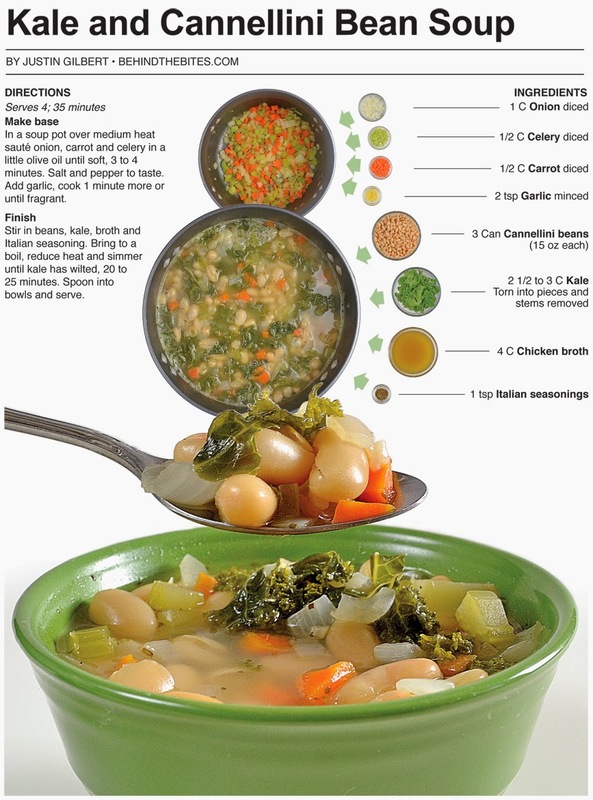 The red dish featuring the finished dressing at the bottom was a clearance item at Pier 1 Imports and it really helps this recipe stand out from the rest. When I mixed everything in the bowl I thought there was no way it would fit into the vessel, by like the sweet corn casserole, all of it fit and the rest is history. Now it’s on to Christmas cooking! In a sauté pan over medium heat cook sausage until no longer pink, 6 to 8 minutes. Remove from pan to a large bowl. Discard all but 1 tablespoon of drippings. Cook onion, celery and green pepper until soft, 4 to 6 minutes. Salt and pepper to taste. Add garlic cook two minutes more. Transfer to large bowl with sausage. 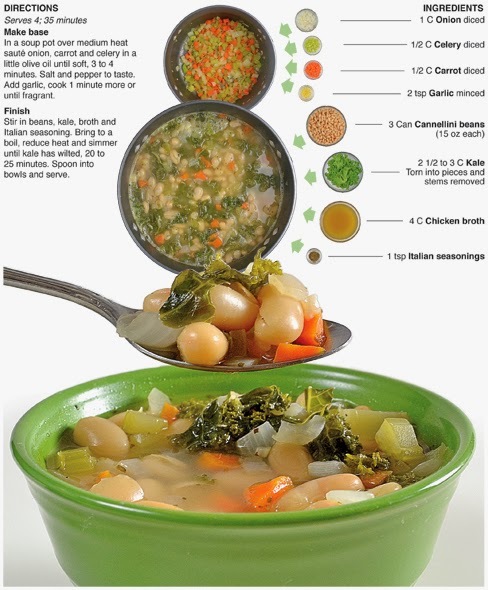 Add dried bread, chicken broth and Italian seasonings to bowl. Mix until well incorporated and bread has soaked up broth. Transfer to a prepared 9 x 13 baking dish. Bake for 20 to 25 minutes or until top becomes brown and with crispy bits. Let cool a few minutes before serving. 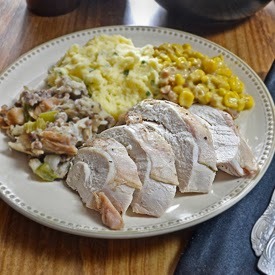 If I’m eating roasted turkey with gravy, I love to have mashed potatoes on the plate. Creamy spuds are my second favorite Thanksgiving side dish behind green bean casserole and when I say creamy, I mean creamy! No lumps, lots of butter and nice wispy peaks. 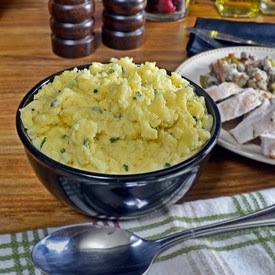 Earlier this fall I made basic creamy mashed potatoes and I prepared this batch the exact same way, but this time I added cheddar cheese and chives to punch up the flavor. I could eat this stuff by the fist full! And that is what I basically did when I served them. I used my finger to scoop a bite out of the bowl every time I passed by and no one was looking. Mashed potatoes to me are like frosting on cake and it’s nearly impossible for me to walk passed without snatching up a sample. Adding further to the temptation was the flavorful cheddar cheese and fresh chives. As I mention in the introduction, I documented a prime rib dinner back in September and creamy mashed potatoes were part of the spread. I made them as basic as possible because I knew that I could use many of the elements again whenever I wanted to make mashed potatoes for a new post. 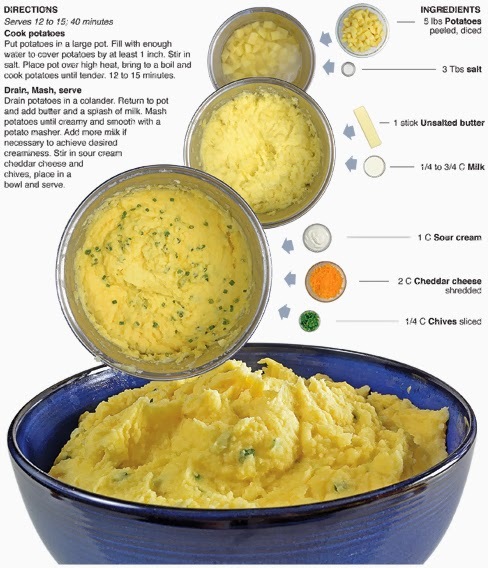 Most of the photography in this recipe information graphic was originally shot for the basic creamy mashed potatoes. Only the last stage featuring the chives and cheddar and the final shot at the bottom of the recipe are new. 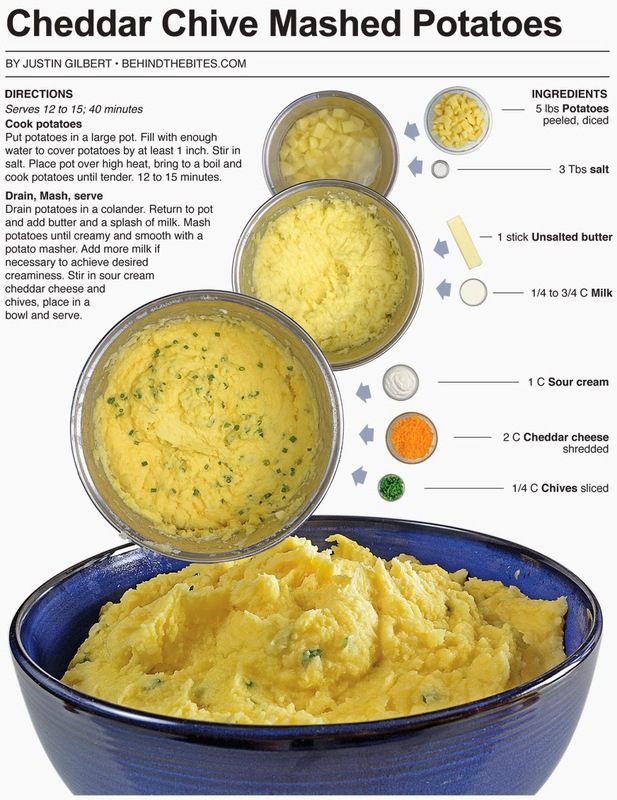 I made this exactly like the basic version until I made the additions of cheddar and chives. I have been re-using photographs of prepped ingredients for a long time, but this is a relatively knew technique I’ve started to develop involving basic recipes. This allows me more time to be creative and less time doing production work. 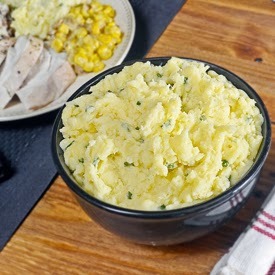 Look for another mashed potato recipe soon, because Christmas dinner wouldn’t be as special without a batch of creamy spuds. Of all my Thanksgiving sides this year, this was the most experimental. 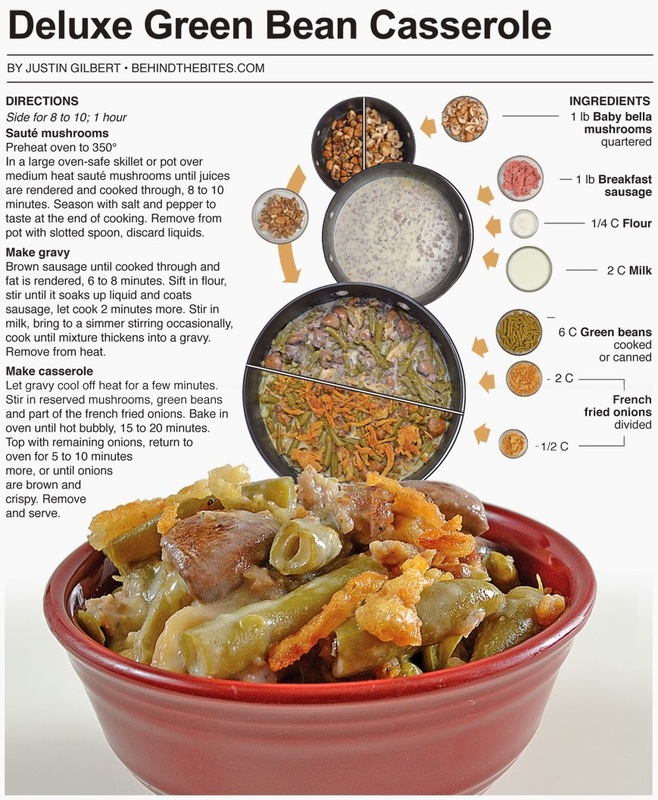 I had no idea how it would turn out, it was inspired by the classic green bean casserole, only I went with sweet corn and cream of chicken rather than green beans and cream of mushroom. 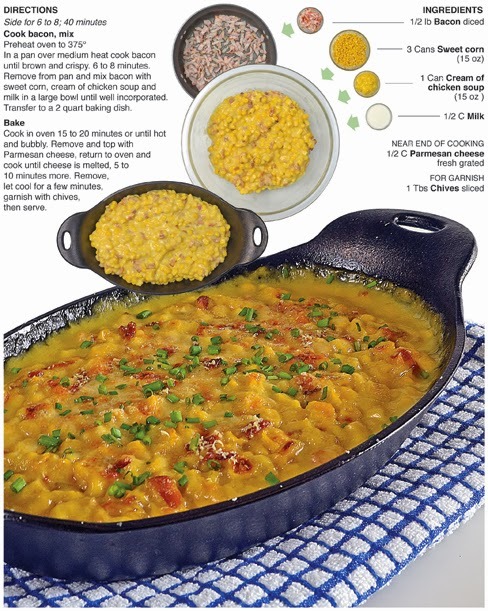 The addition of bacon added a smoky and salty element to the creamy sweet corn mixture. 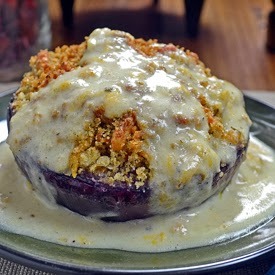 I topped it with fresh grated Parmesan cheese and chives which added rich and oniony hints to the overall taste. 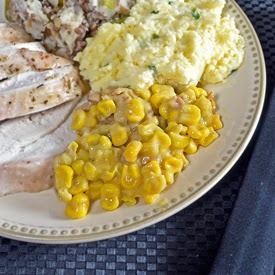 The dish was the most simple of all my Thanksgiving sides. Rendering the bacon takes longer than putting it together, and I baked it along side the dressing to kill two birds with one stone. I do think that another element could be added. 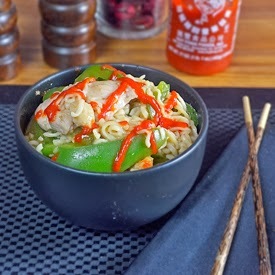 I’m not sure – but the addition of something like red or green pepper might punch up the flavor even more. I’ll have to try that next time. 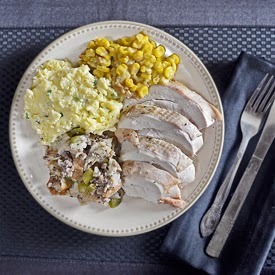 As it is, this is a quick and tasty addition to any Turkey day spread. This dish is really the result of an over-stocked pantry. I closed my camper at our family campground at the end of October. Two of the things I brought home were three cans of sweet corn and two cans of cream of chicken soup. 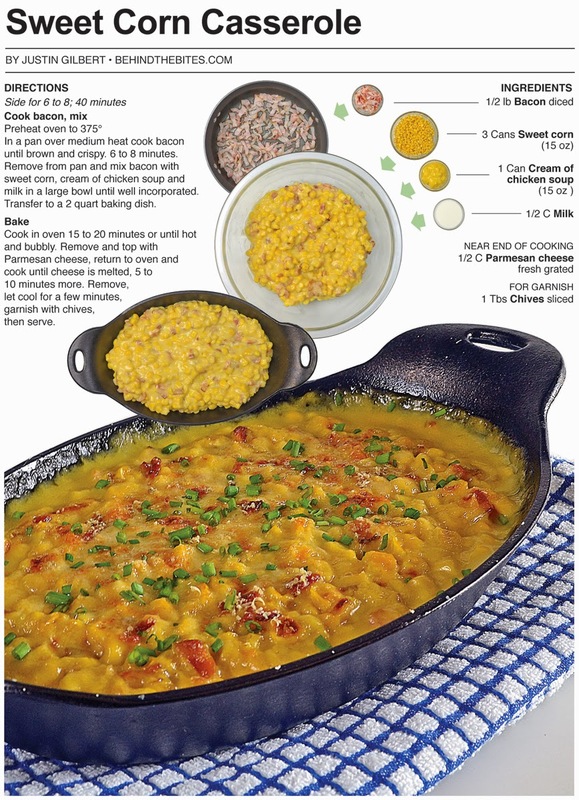 As I was trying to find room on the shelves, the idea hit me to combine the corn and soup and try it for Thanksgiving. I added the bacon for texture and flavor, much like the french fried onions add to green bean casserole. On a side note, I was surprised that the mixture fit in the baking vessel I had chosen, which is pictured in the information graphic. I used the cast iron vessel strictly for aesthetics and to get a great photo. When I started pouring the mix in I thought there was no way it would all fit, but, to my amazement, it did. I had a similar experience with the dressing I made this year. So, I have a tip: Some baking dishes may not look like they can hold a lot, but give it a try, you’ll be surprised at how much a two quart vessel or a 9 x 13 baking dish will hold. In a pan over medium heat cook bacon until brown and crispy. 6 to 8 minutes. 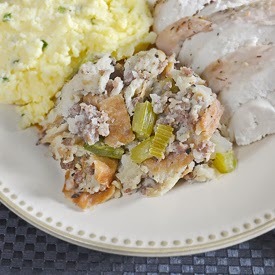 Remove from pan and mix bacon with sweet corn, cream of chicken soup and milk in a large bowl until well incorporated. Transfer to a 2 quart baking dish. Cook in oven 15 to 20 minutes or until hot and bubbly. 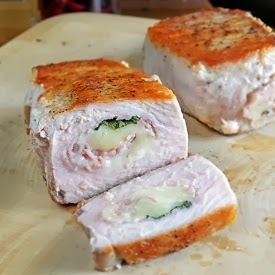 Remove and top with Parmesan cheese, return to oven and cook until cheese is melted, 5 to 10 minutes more. Remove, let cool for a few minutes, garnish with chives, then serve. 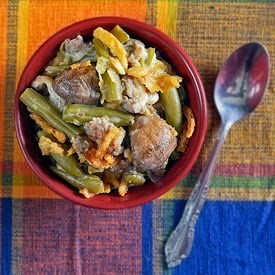 Since I was a little kid I have always loved green bean casserole and looked forward to it every year at Thanksgiving. My Aunt always made a batch for the occasion and it was one of just a few dishes that she ever made. Cooking wasn’t her passion so she kept it simple and green bean casserole was one of her staples. 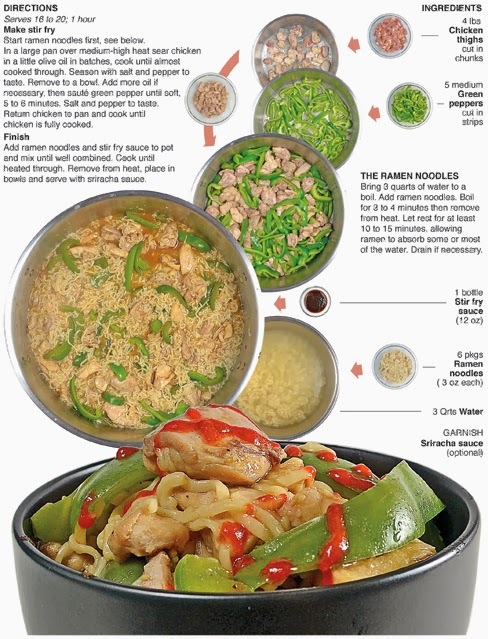 It’s made from a combination of processed ingredients and it comes together in a snap. I have made green bean casserole several times as an adult and I have learned a few tricks to making it extra delicious. 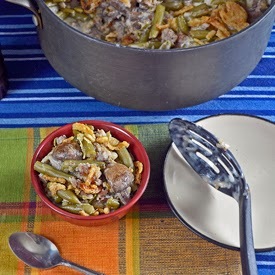 The traditional casserole uses canned cream of mushroom soup, for this recipe I replace it with fresh sauteéd baby bella mushrooms and sausage gravy made from scratch. Bursts of flavor from the fresh mushrooms and seasoning from the sausage add an element of savoriness that the traditional dish doesn’t have. This is a simple way of taking a tasty classic and cranking up the flavor for a special treat fit for any Thanksgiving spread. I figured this out the hard way. I had too much going on to do the recipe justice. The first task of making the crispy onions was a complete failure. With my attention elsewhere, I burnt the entire batch and had to throw them out. I didn't have the time or product to re-make them. Next, I did something wrong with the roux to make the creamy part of the recipe and it never thickened. The beans and mushrooms turned out just fine. The end result was nicely cooked green beans and sautéed mushrooms in a warm milk mixture. People still ate it, but for me, my crown jewel became the thorn in my side. 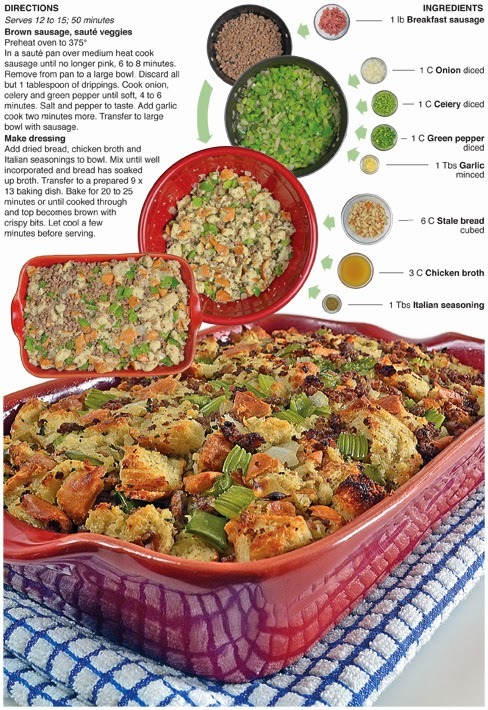 *The recipe presented in this post is really quite simple to pull off for a Thanksgiving spread, especially if you make the sides ahead. At the time, I didn't have the slightest clue on how to plan a big meal. In a large oven-safe skillet or pot over medium heat sauté mushrooms until juices are rendered and cooked through, 8 to 10 minutes. Season with salt and pepper to taste at the end of cooking. Remove from pot with slotted spoon, discard liquids. Brown sausage until cooked through and fat is rendered, 6 to 8 minutes. Sift in flour, stir until it soaks up liquid and coats sausage, let cook 2 minutes more. Stir in milk, bring to a simmer stirring occasionally, cook until mixture thickens into a gravy. Remove from heat. Let gravy cool off heat for a few minutes. Stir in reserved mushrooms, green beans and part of the french fried onions. Bake in oven until hot bubbly, 15 to 20 minutes. Top with remaining onions, return to oven for 5 to 10 minutes more, or until onions are brown and crispy. Remove and serve.